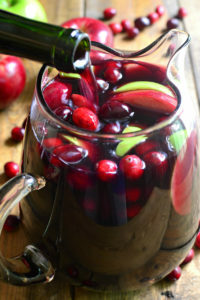 Looking for a Thanksgiving cocktail with wine, or a Thanksgiving winetail? An Apple Cranberry Sangria may be just the way to go. Just mix the following ingredients in a large pitcher and let it sit in the fridge for 3-4 hours, or overnight if possible…. For a lower sugar option, you could do a ½ cup of apple cider, ½ cup cranberry juice, and a few tbsp of simple syrup and then mix with sparkling water in your glass right before serving. Cocktail Recipe and Photo credits go to LemonTreeWelling where I originally found this Thanksgiving Winetail (Thanksgiving Cocktail with wine) recipe. If you’re looking for wines to use in the Sangria recipe, visit tasting rooms in Carmel for a full-bodied wine. Ask your Sommelier or the person pouring the wine for guidance and they will be happy to assist. ← Spiegelau Hybrid Champagne Flute for Ice Wine Too!